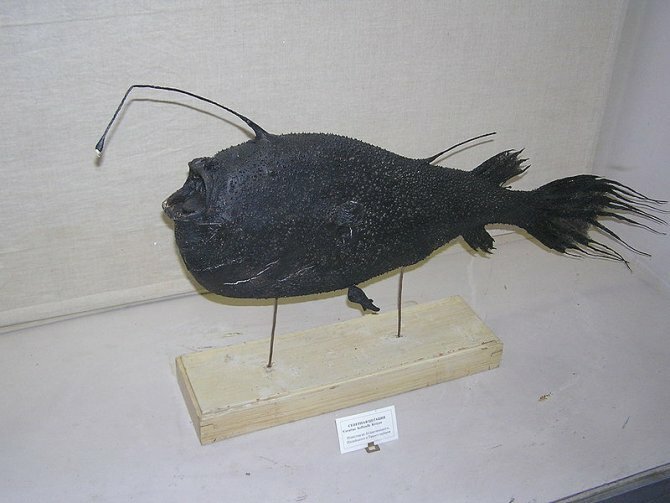 There seem to be few fish from the ocean's depths that don't fit the 'weird fish' epithet and Kroyer's deep-sea angler fish, Ceratias holboelli, certainly shows no sign of bucking the trend. Also given the common name of 'sea-devils', these abyssal oddballs look rather like an under-inflated balloon after a fight with a porcupine. Seemingly made up largely of a huge, gaping mouth filled with equally enormous dentition they spend their time lurking in the deep sea, living up to their angler moniker by attracting unfortunate prey towards their cavernous gape with the help of a bioluminescent lure on the end of a stalk attached to their head. The scientific name Ceratias comes from this lure, being derived from the Greek word 'keras' meaning horn. If the fish isn't weird enough just to look at, it has an even stranger reproductive strategy that it shares with some other angler species. There is a huge difference in size between male and female Ceratias holboelii, females are the largest of their family, growing up to 120cm/4ft while the males seldom exceed 15cm/6in. This discrepancy in size is largely because the males do not feed in the same way as their larger mates. They are in fact parasitic upon the females, and are only free swimming for as long as it takes to find a suitable host using powerful olfactory organs to hunt them via a trail of pheromones before they starve. Once attached to the female, the male releases an enzyme that helps fuse them together, slowly losing his digestive system, then brain, heart and eyes until he is little more than a pair of gonads ready to supply sperm in response to hormonal changes in the females bloodstream which he is now permanently attached to. More than one male can become attached to a female in this way, meaning she has a selection of mates at hand whenever she is ready to spawn.